In Albania, during the construction of the gas pipeline, workers stumbled upon a unique multi-layered cemetery, the burials on which belong to different periods of human existence. According to The Associated Press, one of the largest ancient cemeteries of 4000 square meters. m. was excavated by a team of 50 archaeologists near the village Turan in the south-east of the country. The find was made by Turkish workers laying a gas pipeline there. Works were suspended for excavation. As a result, a large number of cultural layers were discovered. The oldest were traces of the settlement relating to the Neolithic. 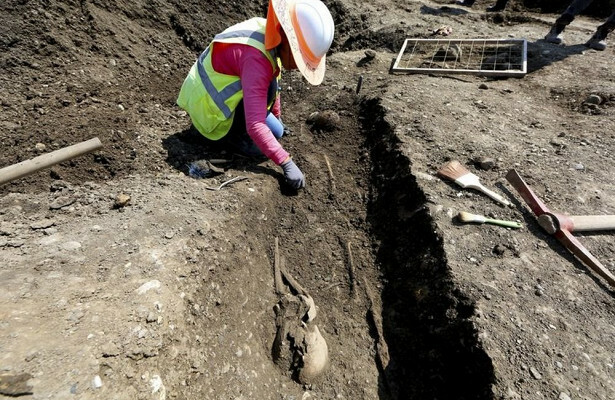 In addition, three cemeteries were discovered. They are located one above the other. Total found about 1000 graves and 900 skeletons belonging to the epochs of the Iron Age, the late Roman Empire and the Middle Ages. Archaeologists also unearthed a lot of artifacts: a large number of rings and gold coins, earrings, bracelets, fragments of dishes, swords, daggers, spears, and more.